The prices of a majority of the realty projects in the affordable segment, which is the sub Rs 30 lakh category, witnessed a steady or an upward movement during the last six months. 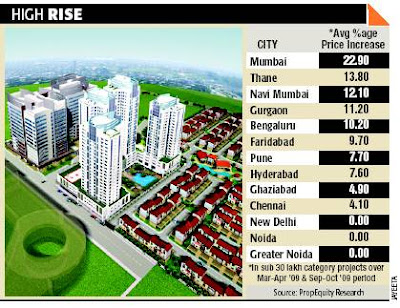 According to a joint analysis by SundayET and PropEquity, a real estate data analytics and research firm, out of 822 projects across 13 major cities around 41% or 333 projects witnessed a price hike during the last six months. The analysis compares city-wise change in project pricing over the period March-April 2009 and September-October 2009 for affordable housing projects. Industry experts feel that the price increase in the affordable segment may move the focus soon to the mid segment. “The Rs 30-60 lakh segment will see huge demand. However, going forward the focus on the sub 20 lakh category may get diluted to some extent,” said Navin Raheja, MD, Raheja Developers. Buying real estate? Read this first!